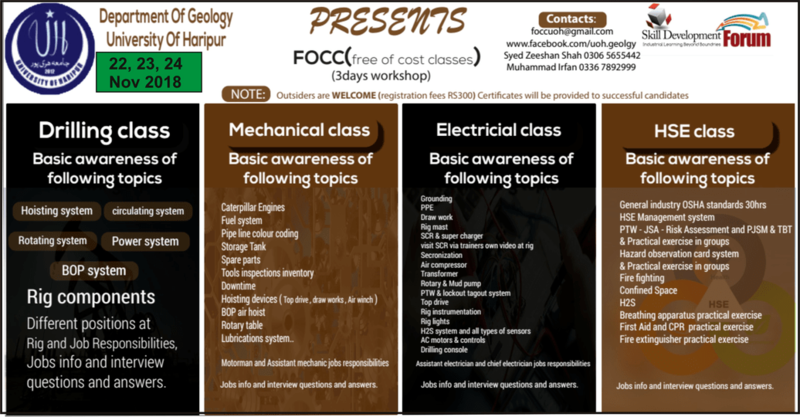 Department of Geology, The University of Haripur is going to conduct a 3-days Free of Cost Classes (FOCC) Workshop-2018 on 22-24 Novemeber 2018 in The University of Haripur. An eight member delegate comprising highly trained officials in diverse fields of Petroleum, Electrical Mechanical and Health & Safety sectors will be here to provide technical knowledge to the students aided with sessions of practical exercises. 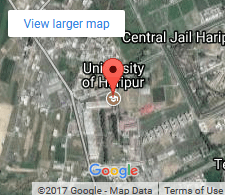 Resource persons having practical experience of national and multinational companies will provide a valuable opportunity for students to gain industrial knowledge. This forum also provides an opportunity of a meet up between students of similar career goals and highly skilled and experienced professionals of Exploration & Production (E & P) sector. This 3-days Workshop will consist of following four classes that will be conducted separately. Certificates of successful training and completion will be provided to the candidates. Registration Fee for this workshop is 300PKR (Being charged for expanses of certificates). Students from other relevant departments or institutions are welcome and encouraged to apply.